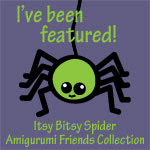 amieggs: toy chest & free bunnies pattern!!! a while back Margarita from Red Ted Art asked me if we could double post some crochet pattern... and here it is!!! And since a toy chest is not a toy chest without toys, I came up with the teddy bear and the bunnies!!! they all fit perfectly inside the chest, and look great next to it too! Bind off and weave in end. Take some black thread and embroider nose in a Y shape. The ears consist of two parts sewn together. Bind off leaving long tail for sewing. Bind off leacing short tail. Use the white tail to sew the pink part in front of the white. Then sew on to the body in the desired position. Weave in ends. I love the puff bunnies I'm a beginner loom knitter is there ways to convert crochet to loom knitting? Hi! 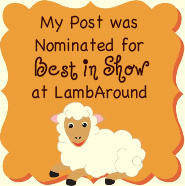 I just gave you an award for being a blog with substance...I love your blog!!!!! New here, super cute blog. I'm a bit obsessed with kawaii Japanese crafts..ur...make that EVERYTHING. I'm a new follower :) Can't wait to learn to knit/crochet good enough to make some of your crafts. Absolutely A-DORABLE! Love it! Thanks for the pattern! What a cute chest! And I love the teddy bear! Thanks for linking up with for Friday Favorites! I love free crochet patterns! I've got to get the PIG pattern! Maybe we could do a post swap or blog guest spot! Thanks for linking up to Topsy Turvy Tuesday's! Omg you're amazing! Thank you for the patterns! So, now that you have an outgrown toy (or better yet, a pile of outgrown toys!) where do you donate it/them?